heart and strong leadership skills. radiant personality that shines and brings warmth and smiles to those around her . She is very easy to talk to. variety of new people and makes her adaptable to different kinds of personalities. and inspires those around her with charm. She’s a fun person to be around. interpretation, colour and chakra therapy. facilitator, Vibrational Colour therapist and Belly Dancing performer. the young age of 12 and oracle reading at age 17.
definitely recommend your services for future events. The word or term Psychic is both an umbrella word for Psychics, Intuitives, Fortune tellers, Sooth-sayers, Seers, Diviners, Oracles, Gypsies Mystics, Spiritualists, Mediums, as well as by the tool a reader may use: Astrologist, Cartomancer, Coffee Grounds Reader, Crystal Ball Reader, Face Reader, Handwriting Analyst, Numerologist, Palm Reader, Tarot Reader, Tea Leaf Reader. However, Psychic also means (and perhaps is reflective of the most accurate use of the term) the abiltiy to use a normal sense to a heightened degree and in unusual ways. Sight = Clairvoyance, Feeling/Touch = Clairsentience, Hearing = Clairaudient, Knowing = Claircognizance, Tasting = Clairgustance, and Smelling = Clairalience. Many times people will ask for a Clairvoyant as that tends to be the most understood psychic sense — probably because it appears to be the most dramatic. However, any psychic sense used well makes not one sense better than the other. The psychic part in our company name 3 of Cups Psychic Event Entertainment is reflective of the umbrella term and most popularly understood meaning of the word psychic though it’s not the most accurate term as just read. An Intuitive is quite a rational person. The Tarot is a collection of cards which contain an allegory / story of life milestones, mystical experience, archetypes, and more. Some Tarot decks have picture stories on all cards while others only have symbols similar to playing cards. 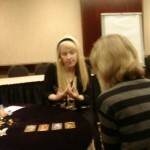 In fact, many say that Tarot originates from games that used a playing deck. Tarot has it’s physical origins and/or popularity in the Renaissance period (1400-1500’s) and it re-emerged in popularity in the late 1800’s and into the 1900’s. 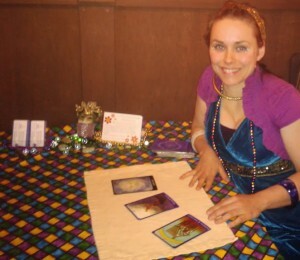 Tarot is still wildly popular in the modern person’s mind. When someone thinks of a Fortune Teller this is one of the tools that comes to mind of an old Gypsy lady reading the future. Tarot is useful for telling the story of a guests life from past, present, and future as well as past lives. 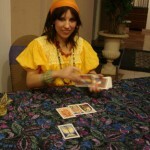 Leela provides psychic tarot readings all over the greater Toronto area especially with a focus on the West End of Toronto and downtown Toronto. Some locations may require a travel expense. She has attended all sorts of events such in the theatre, birthday, and holiday parties, friends night in, etc. Leela will travel throughout the GTA given travel expenses are paid. Her free travel zone is anywhere that is no more than a 45-60 minute trip, by transit, from the west end which includes Etobicoke to East York and Sheppard to Union station. Toronto, Downtown, East York, Central, The Beach aka The Beaches, The Danforth, St. Clair West, GTA, North York, Markham, Brampton, Vaughan, Aurora, Woodbridge, Mississauga, Oakville, Barrie, Bolton, Milton, Halton Hills, Pickering, Whitby, Etobicoke, Clarkson, Port Credit, Scarborough, Ajax, Woodbridge, Bramalea, Thornhill, York, Malton, Meadowvale, Streetsville, Peel Region, etc. This entry was posted	on at and is filed under The Party Psychic Readers. You can follow any responses to this entry through the RSS 2.0 feed. Both comments and pings are currently closed.